There is a book I got on sale that show how to do some wonky/primitive type patchwork. The book is "Cut Loose Quilts." I decided to make some of the blocks for a backing that I am piecing. 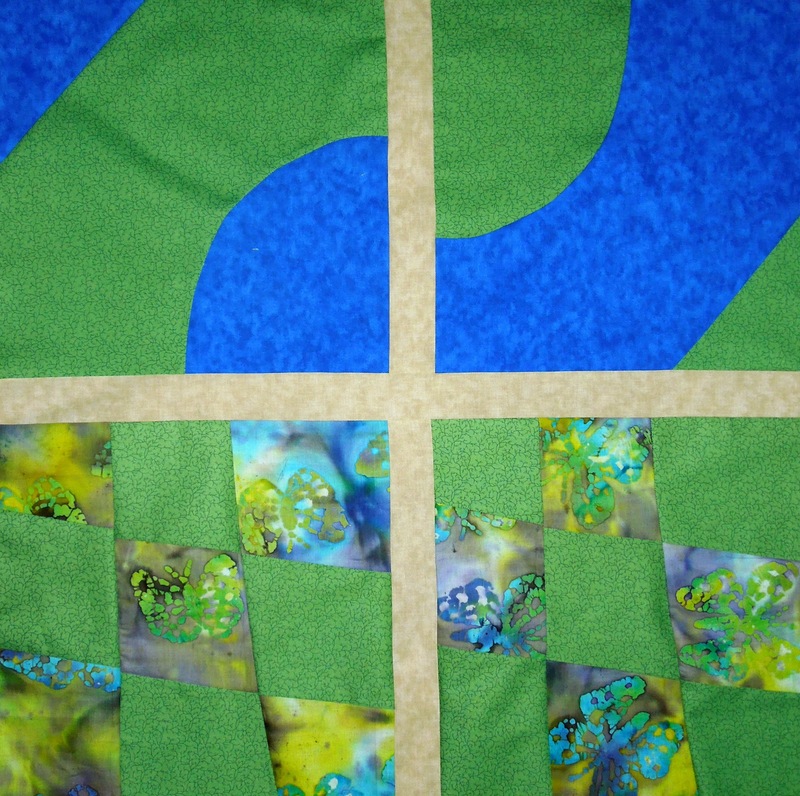 Test blocks can easily be pieced into a backing, making the back of the quilt fun and interesting. So I did two different stacks of fabric, repeating the green fabric in each. Since this is a stack and cut method you get two blocks for each stack of two fabrics. They are semi-mirror images. I just sashed them and made one larger piece. While I was sewing this, my mind started comparing making patchwork to our lives. 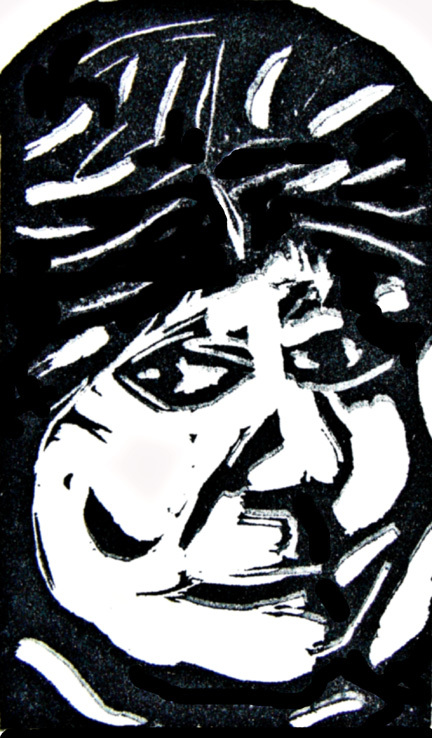 Like patchwork, our lives are made up of lots of pieced that are merged together to make a whole. Sometimes the pieces aren't perfect in either our lives or in our patchwork. Occasionally it is a bit skewed -like the pieces in my example above. My maternal grandmother made quilts using whatever she had. They were made for a purpose, but she did try to make them look pretty too. Sometimes there is a piece that doesn't seem to "go" but she had it so she used it. Our lives are like that too. We have some pieces that we struggle to understand, but eventually it comes clear and we realize why that "piece" is in our life. If we are smart and have the right attitude we can use it to make our "quilt" more complete - just like Granny did. 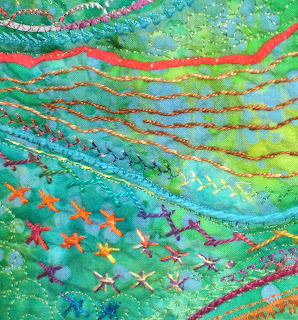 Friends are a great part of the patchwork. 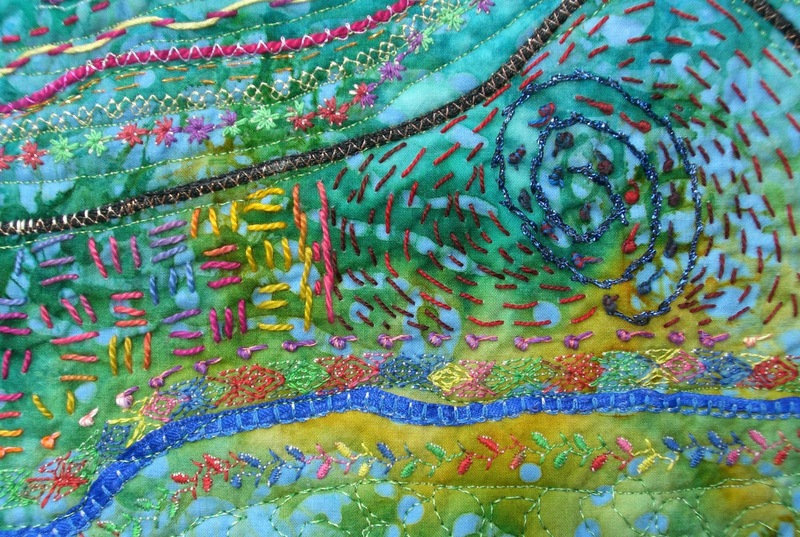 I am amazed at the friends I have made while blogging and quilting. 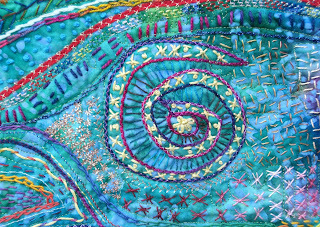 I would like to say "Thank you for being a part of the patchwork in my life." There is a project being hosted by Sew Bitter Sweet Designs and Hopeful Threads to send handmade gifts to deployed servicemen. It is called Remember September. I just felt like I have to do something to say "Thank YOU!" to all those who go in harm's way to keep us safe. 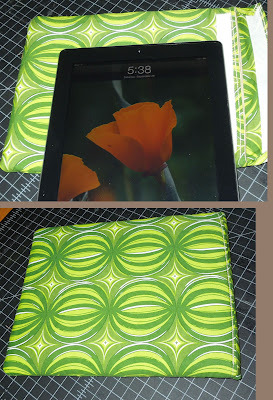 I made one iPad cover but I am not totally happy with it. I am planning to replace it with two more that are just a bit larger. This one is snug on my iPad 2 and will not close with a first generation iPad in it. (I checked using one belonging to a friend.) I think it would work fine for the larger Kindle Fire. So I want to increase the size by half an inch all around. I also want to use a different closure. Anyway, here is the one I made. Perhaps I can find a better closure method. I started with another pattern and botched it totally. I cut the lining for this one wrong the first time. I don't know why I couldn't seem to get it right. Sometimes those you love give you a present that makes your heart sing. I have a birthday coming up in a couple of days; so my Nana sent a present. I had no idea what she would send but she always finds something that she knows I will enjoy. 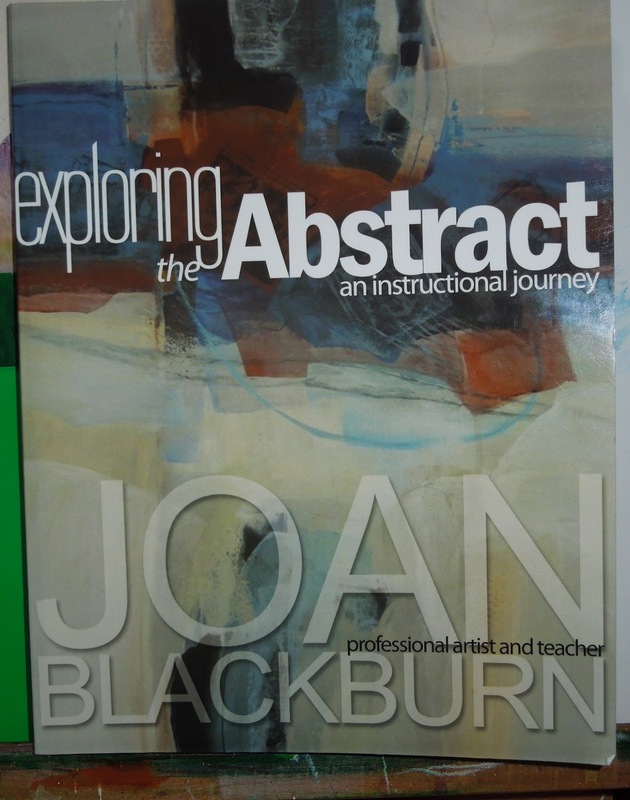 In the class, the teacher and author, Joan (pronounced like JoAnn) kept misplacing things. 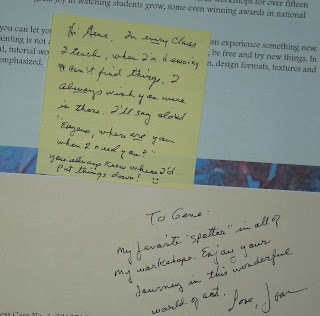 She would say "where did I put ____" I was always watching intently and trying to remember every detail, so I knew where she put it and would say "look ---where ever---" She told me I needed to be in all her classes and be her assistant. Ha ha. 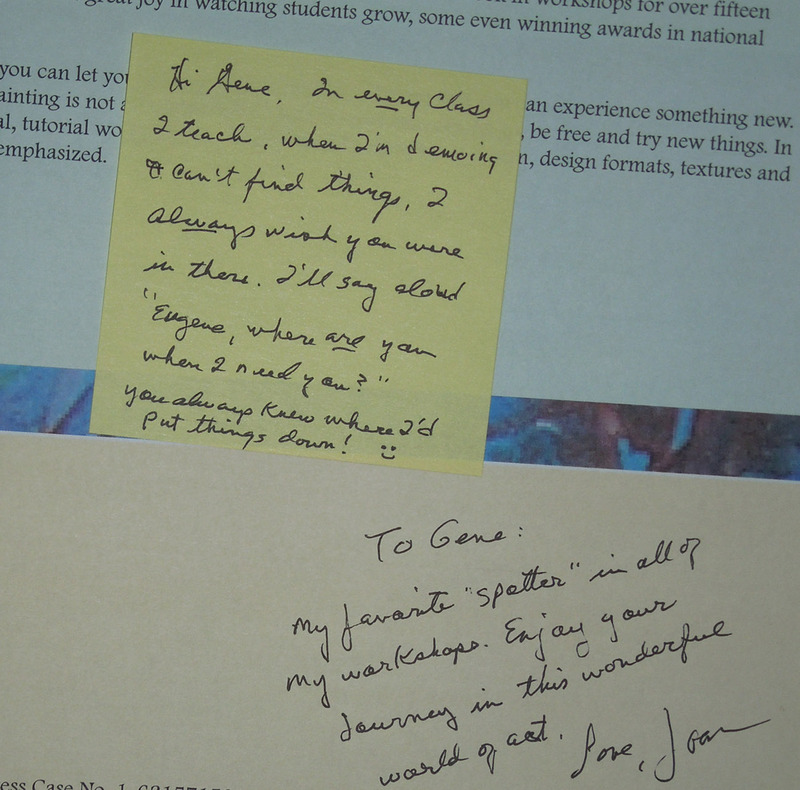 The special surprise in this book was the autograph AND the little extra sticky note. I know I will enjoy reading this book - and who know what it will inspire! After that title I am sure you are wondering if I have lost my mind. Ha ha... As a friend of mine says "I never claimed to be sane." Seriously though, I did finish a quilt top this evening (Tuesday.) 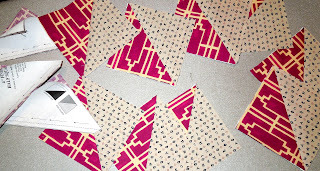 This is the other Beginner's Quilt Along quilt that I am making. I did this one in bright colors with a light sashing. The majority of the sashing is a white with tiny light blue pin dots on it. Of course I ran low on that fabric, so I did some creative planning on the layout. I also was trying to balance the color scheme and realized that I had a block that wasn't in the quilt along. Ha ha. 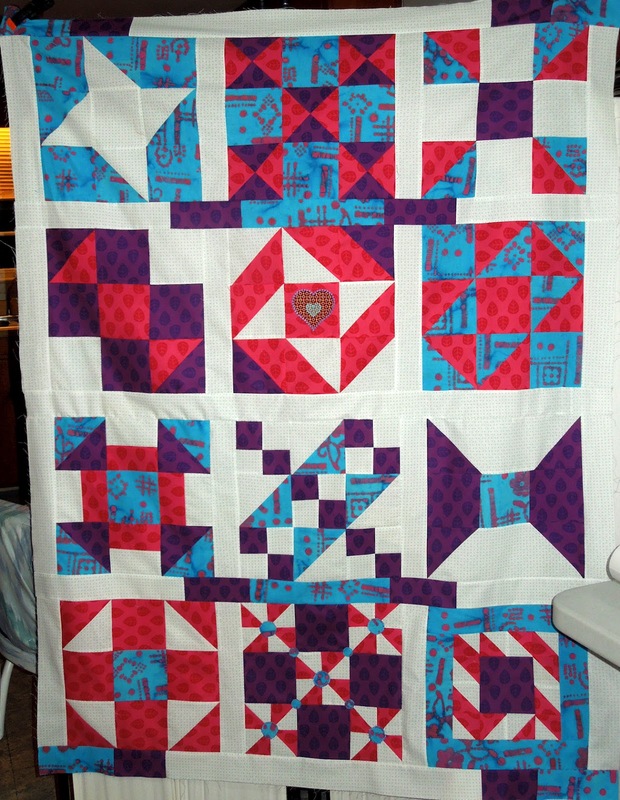 the lower right block (behind the edge of the table) is one that I made with some extra thangles pieced hsts. I just made it up as I pieced it. There are two more blocks that will go on the backing of this quilt, but they didn't have the blue edges that I wanted in it. I have the center seam just basted as I will quilt this in two pieces and then join it, but I wanted a full top to show. 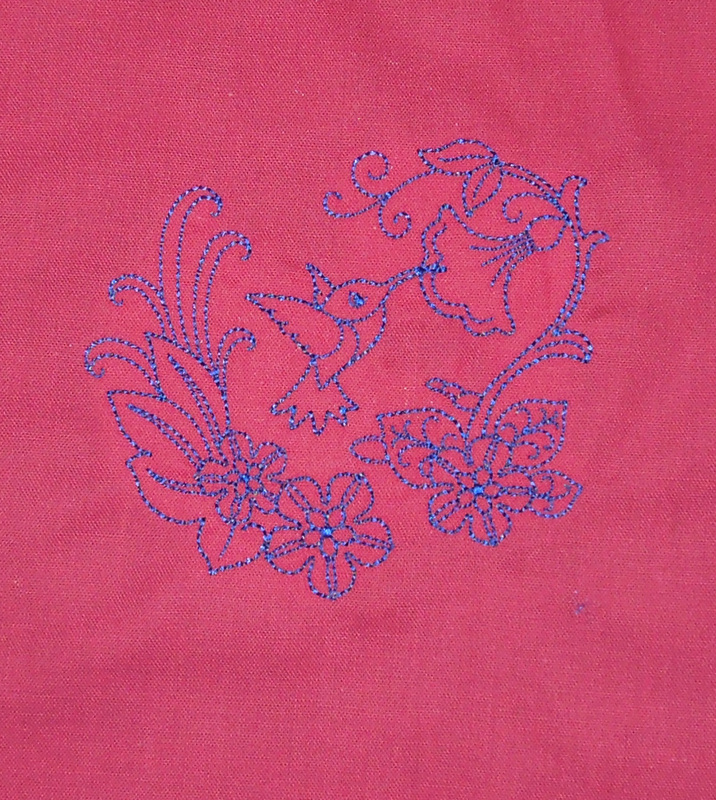 The other BQA top has several embroidered blocks. This one only has one - second row-middle block. The heart is embroidered on it. Now how about the bird on the wing? 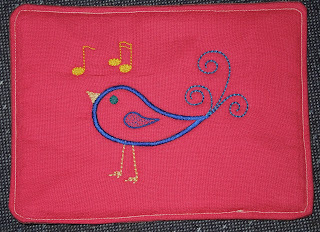 I just wanted to try a new product so I embroidered this piece on a plain piece of fabric. I have no idea what this will be used in, but I always manage to use my odd pieces at one time or another. 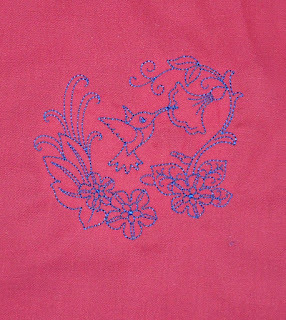 I do love the hummingbird design and although this was a "redwork" design, I changed it to "blue work" due to the background fabric. Has your sewing machine been humming lately? Mine hasn't gotten the attention I would love to give it, but I do sneak in a few stitches any chance I get. I realized that I have not posted about the Quilt Angel project for a while. The response has been good, but we are still short a few quilts. Last year we were able to give a quilt for every teen in the shelter at Christmas and we hope to do the same this year. Due to privacy issues, we can't post pictures of the shelter residents but here is a picture of Ms Jackie and me sitting in front of the sofa with all the quilts from last year. 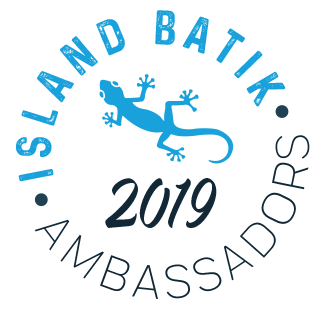 I am happy to annouce that we have a NEW Sponsor for the project. I am very pleased to announce that Kelly of I Have A Notion (IHAN) has generously offered a gift certificate for $50 in merchandise. It does not include shipping so you would have to pay that yourself. This is a wonderful prize. I went over to the IHAN store to look around and found that I could spend that $50 very easily. 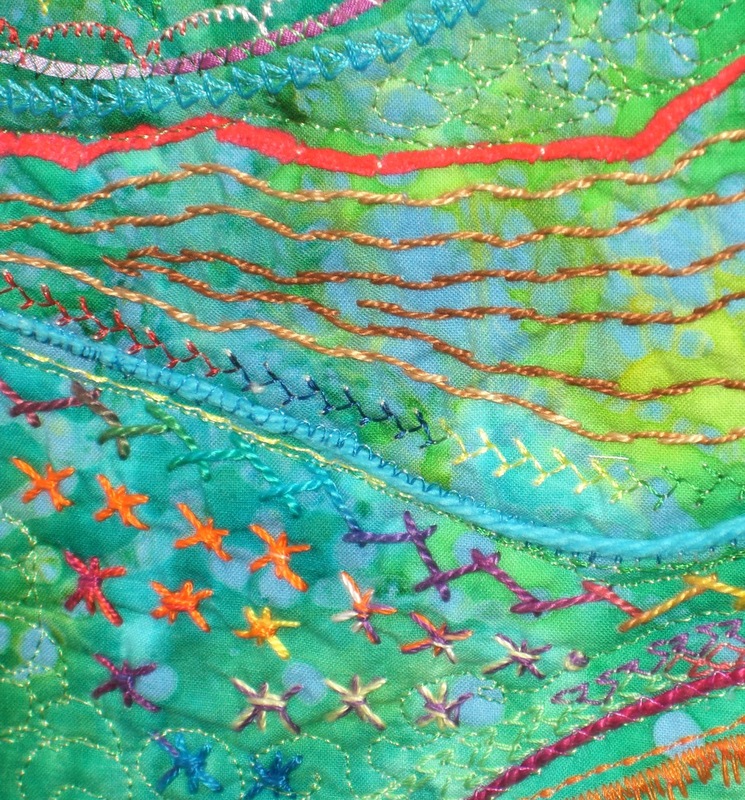 My mouth watered over the Aurifil threads like the Edyta Sitar Over the Rainbow 50wt Cotton Thread Collection. It is listed at only $36....so you would have more left to spend. How about treating your hands (and/or feet) to a Lavishea lotion bar? The Orange Pomander fragrance sounds good to me, but there are others also. So, there are now three gift certificates that you could be eligible to win by donating a quilt to wrap a "teen in need" with love. Plus you will win my heartfelt thanks AND feel a warm spot in your own heart. I knew that the facility is in Alabama since I made the delivery last Christmas. I also knew that the area it is in is part of the Tennessee Valley region. I just didn't really know why it is called that. So I asked questions and did some research. The Tennessee River runs from Knoxville, TN down and into Alabama, through just the corner of Mississippi, back into Tennessee and up into Kentucky where it feeds into the Ohio river. Whew! what a route. Then the Ohio river feeds into the Mississippi river that flows to the Gulf of Mexico. In the past the Tennessee River frequently flooded in the "Tennessee Valley" which is in North Alabama (the valley formed by the river.) To relieve flooding and to provide employment at the end of the Great Depression, the TVA (Tennessee Valley Authority) was founded and built dams that provided jobs AND electricity. Okay end of history lesson. You can read more about it if you are curious. So that is why it is called TVFS - Tennessee Valley Family Services. And they do have a target service area of a few counties in Alabama. However, any teen going to a SafePlace location in the area to seek shelter can be placed there regardless of where they are from. I hope your week is full of love and joy. I promised that I would be showing the progress on the art piece I am working on. 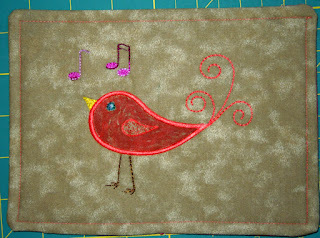 I started this piece as part of a class I am taking on Craftsy. 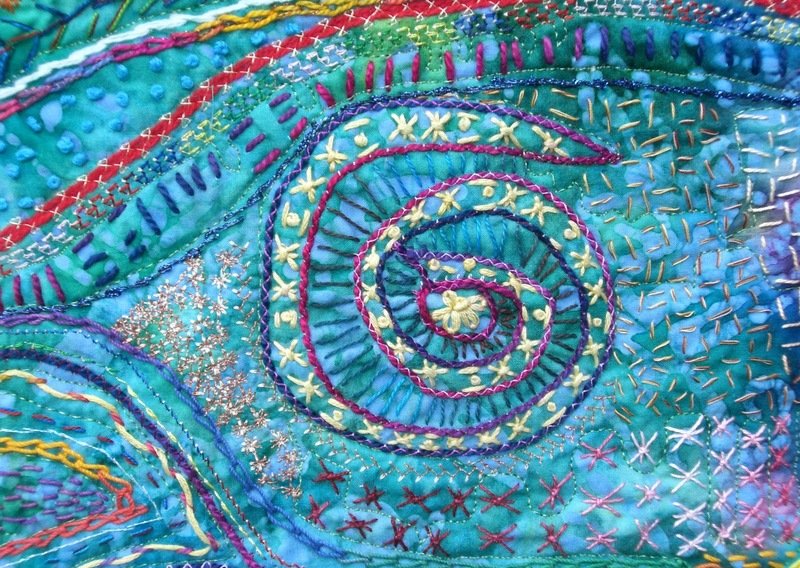 The class is called Stupendous Stitching. 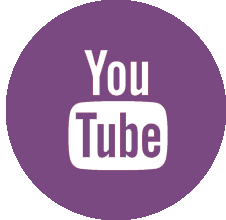 You can learn more about by clicking on the link. I have not been doing a lot of work on this lately, but today I got some stitches in due to the rain and no morning walk. So here are some detail shots. 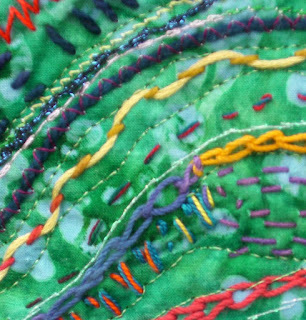 In this shot you can see some French knots, some simple Xs and some sheaf stitches. There is one section of the couched "knot" that I have not filled yet. I am still waiting for the right stitch to pop into my head. This is what I call a weaving stitch. 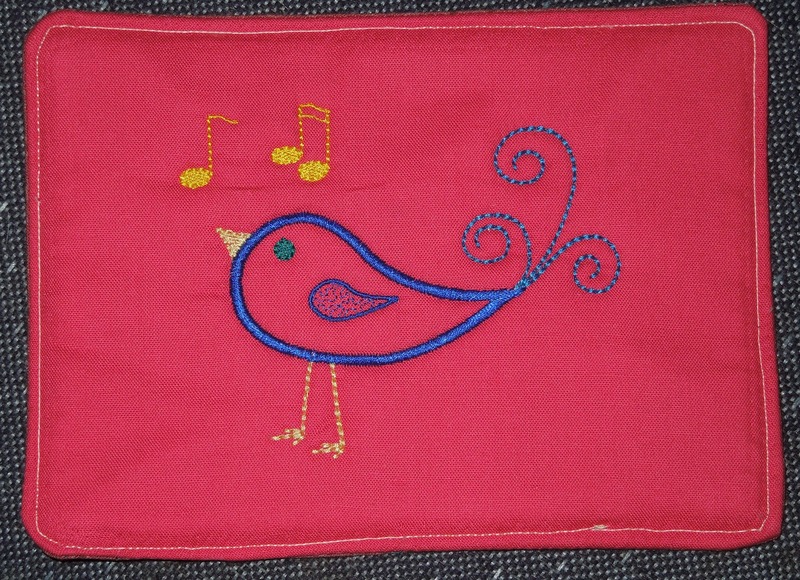 I do a running stitch and then go back with another thread and weave it in and out through the running stitches. 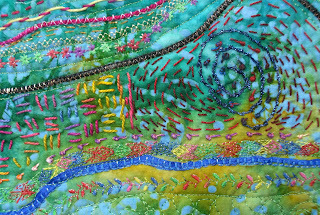 Finally a wider shot although this is not the entire piece. 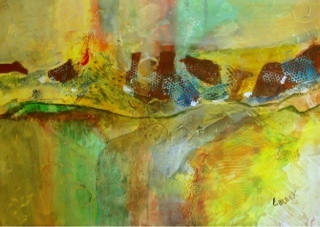 The fabric is some that I hand dyed and the added spatters with liquid acrylic paints. I used marbles to create a resist that left the round shapes with starbursts in them. I have to say I like the visual texture that I achieved by hand dying and spattering this fabric. Today is a special day to me. It is also just a bit sad. My sister had a short life. She was in a medical accident almost 30 years ago. Today is her birthday and I am choosing to honor her life today. She would have been 57 today. She was my sister, my protector and my friend. I miss her laugh, her sharp wit and her loving ways. Rest in Peace my darling Charlotte. Your children have grown into amazingly wonderful adults that you would be so proud of. Forgive me if I don't reply to comments. Sometimes the memories overwhelm me tear ducts. Edit: Beaquilter asked what happened. Even though this occurred in Alabama, it made national news. Here is a link to the New York Times Article. We received a total of 16 quilts, one for every resident that was there. The day of the delivery was amazing. We delivered on Christmas Eve (partly because we started the project too late to manage it any time sooner.) There were two residents that did not go home for Christmas. Why? (I had to ask, didn't I?) The one answer made me so sad, but also glad that we had done the project. "It just isn't a safe place for her to be right now." While this broke my heart for her, I realized that I have so much to be grateful for. My parent's house has always been a safe place for me. Even to this day, when I am acting as partial caregiver to my mom, I feel safe and loved at her house. I am truly grateful that I always had a safe haven. One touching moment from the delivery was when the two picked their quilt from the stack. One picked her quilt and was really looking it over when she saw that the giver had put a label. In awe, she asked "Did someone in Virginia really make this for me?" 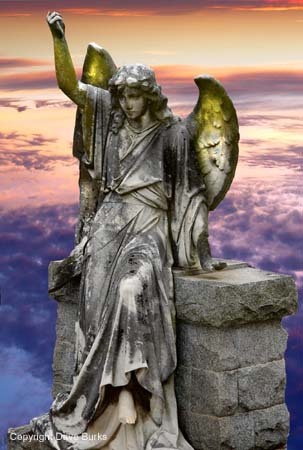 Obviously she had never had so tangible a gift that was given with unconditional love. I managed to smile through the entire time we were there for the delivery but at times the tears really threatened. I thought I knew the real meaning of Christmas before that but it really gained a deeper meaning for me that day. Your binding can be finished by machine - it is generally faster and stronger, but if you want to hand sew it down that is okay too. Labels are a great addition to the quilt - you don't have to put your name if you don't want to. I would love for you to put the STATE your are sending it from and maybe "made with love" on it. If you wish to donate a quilt but remain anonymous, please put a note in with your quilt so I don't mess up and list your name in a blog post. If possible we will deliver on Christmas Eve again. It really made Christmas more meaningful to me last year. Last year we had a prize and this year we want to have prizes too. 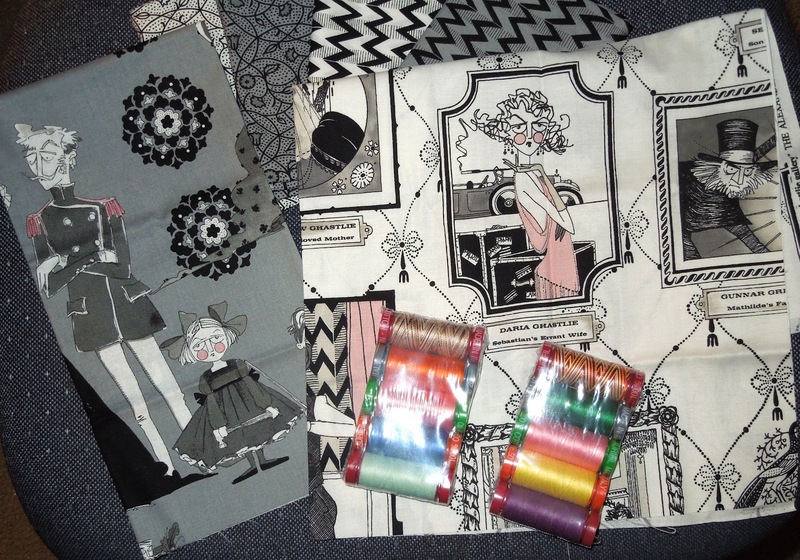 We are offering two gift certificates for $50 each to an online fabric store such as Connecting Threads or Fabric.com. If you win I will let you choose the store. So there will be two prize winners. But honestly everyone who has enough love in their heart to do this is already a winner. I will also be happy to accept prizes from other sources. So if you have a store(or just a big heart) and want to sponsor a prize, please let me know. I answer all comments unless the post states otherwise. 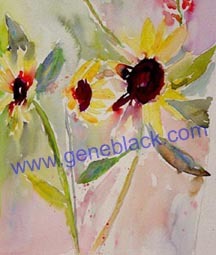 You can also email me at geneblack At gmail (dot) com. The shelter home for this project is The Ogden House. This shelter is a part of the Tennessee Valley Family Services organization. They operate on a minimum budget and rely a lot on donations. Needless to say, the quilts are probably the best Christmas present the residents get. One of my friends is making a pillowcase to go with the quilt she is making. I will probably include a machine embroidered lace bookmark with mine. An extra gift is appreciated but not at all necessary. But just for the fun of it, if you include an extra gift I will do another giveaway with a small prize that I will make just for you. Just be aware that it may take me some time to get it to you as I will make it specifically for you. 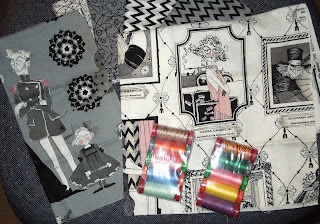 Over at the Sew Sweetness blog, I won a nice Pellon assortment. Uh....I borrowed her picture of this, I hope you don't mind Sara. There is a nice bag of cluster fiber - think doll babies or maybe creatively shaped pillows. Some Fabric Magic that will texturize fabric for fun textured effects. And finally some 300 thread count white fabric. It is made of a soft long staple cotton. Thanks to Sara and to Pellon for this great giveaway! Now for the News Flash! 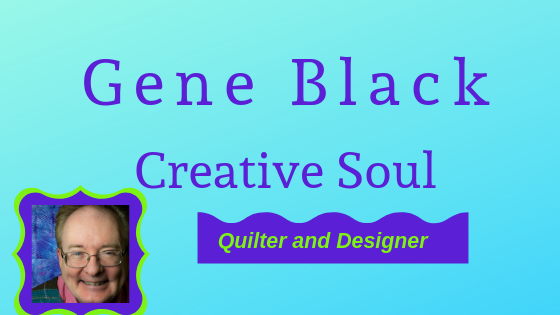 Tomorrow, Saturday the 15th, I will be guest blogging at Color Me Quilty. 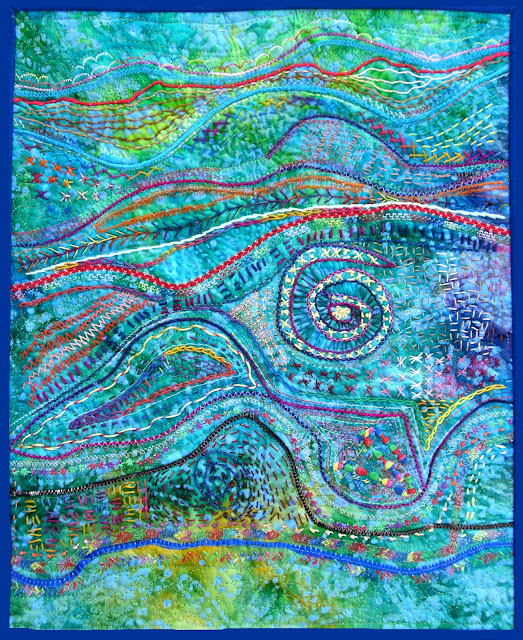 It is QED that is Quilty Embellishment Day and I will be showing some simple beading on a finished art quilt. Come here first though and see the quilt I have been keeping in hiding. It is all about embellishment. 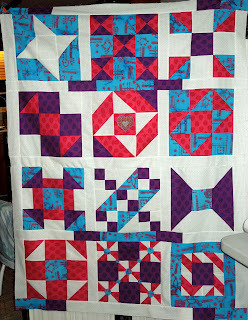 Oh yes, I do have this quilt top finished for the Beginner's Quilt Along! However, if you dont' have a machine to make your own. I have a giveaway going here. And today I am changing it to have TWO winners. The second winner will get this mug rug. 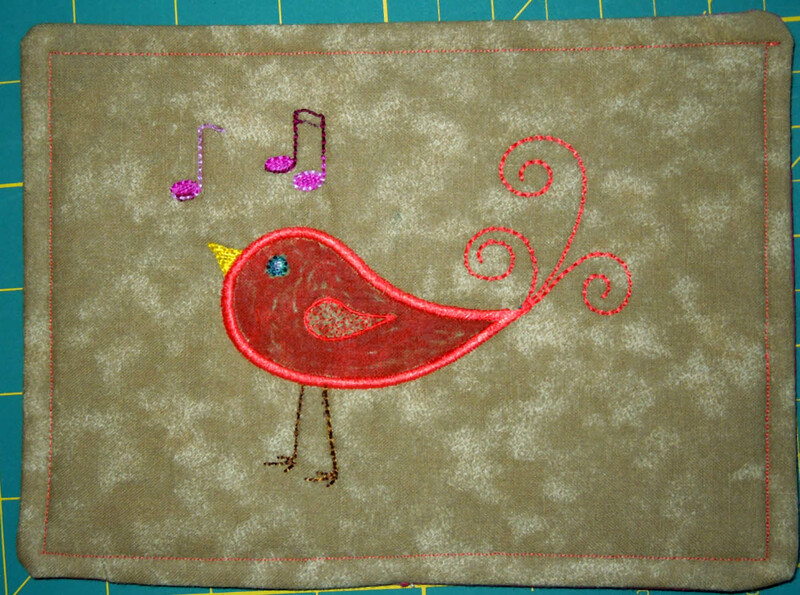 I went with different colors and also used a Sharpie marker to color in the bird - and to recolor his legs and feet since the thread I used almost vanished on this fabric. So if you aren't going to make your own - or if you just want to have one that I made - go to my Mug Rug Giveaway (US only - sorry my international friends) post and enter (US only - sorry my international friends). But be sure to comment on this post too. You never know when a comment could get you a surprise later. Remember go to the Giveaway post to enter - comments on this post do NOT enter you to win either mug rug. What you do is cut two pieces of cloth ten inches wide. (I cut mine a little bigger and then trim afterwards) put them right sides together. (this is important but please don't ask me how I know!) 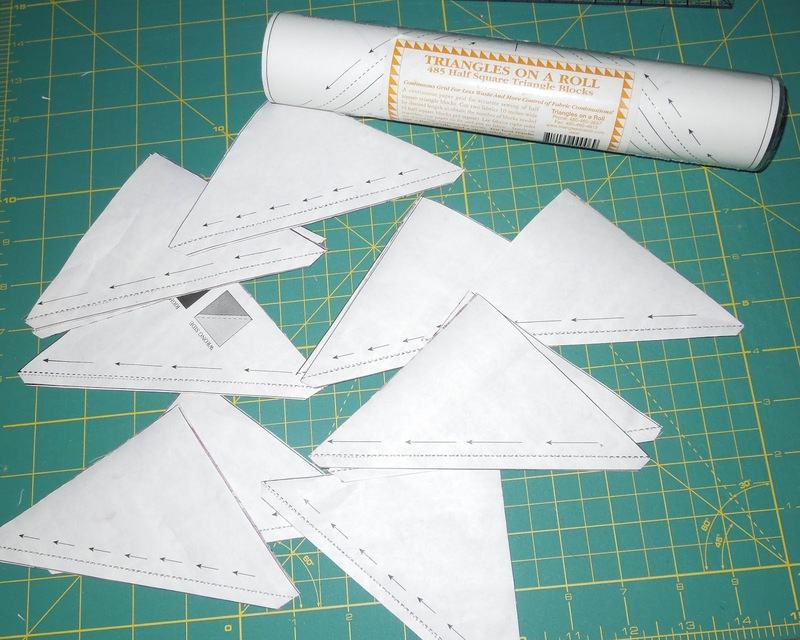 Pin down the paper and sew on the lines following the arrows. Then cut them apart. Sorry I forgot to take the picture of when it was solid but sewn. Then you go to the iron and press them open. I leave on the paper for this as it helps to stabilize the edges. Then all you have to do is sit and pull off the papers. That is a great job to save for TV or movie time. I am thinking these pieces may end up in Mom's headboard cover. Now I have to decide what to do with the Ghastlies. I am sure I need to make something for ME with some of it. I find little Prudence and her Hammer to be so funny. Maybe I will make myself a new mug rug with her on it!